THIS IS A BEAST OF A COMPUTER -SUPER FAST i5 QUAD CORE, 16 GB DDR4 RAM -CHECK IT OUT ! DDR4 16 GB DDR4 RAM. Plus, you will wield the power to create, edit, and share 4K and 360-degree content all with the lightning speed data transfers of Thunderbolt 3 technology. THIS IS A BEAST OF A COMPUTER -SUPER FAST i5 QUAD CORE, 16 GB DDR4 RAM -CHECK IT OUT ! DDR4 16 GB DDR4 RAM. DDR4 & DDR3L Support. DIYPC Crystal Black USB3.0 Steel/ Tempered Glass ATX Mid Tower Gaming Computer Case w/Tempered Glass Panels (Front and Left Side), 4 x RGB LED Ring Fan (Pre-Installed). CUSTOM GAMING PC RGB i5 7500 GTX 1080 WINDOWS 10 PRO WORKS WONDERFULLY!!! Manufacturer=ASUSTeK COMPUTER INC.; Product=STRIX B250F GAMING. Hard Drive(s) Details. ==================================================. Network Adapter(s) Details. Model=WD My Book 1170 USB Device. THIS IS A BEAST OF A COMPUTER -SUPER FAST i5 QUAD CORE, 16 GB DDR4 RAM -CHECK IT OUT ! DDR4 & DDR3L Support. DDR4 16 GB DDR4 RAM. 1050 GTX GRAPHICS CARD. CALL OF DUTY WWII GAMING COMPUTER. 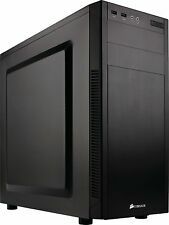 ATX Mid Tower Gaming PC Case with Side Panel Window. THIS IS A BEAST OF A COMPUTER -SUPER FAST i5 QUAD CORE, 32 GB DDR4 RAM 1060 GTX -CHECK IT OUT ! DDR4 32GB DDR4 RAM. GeForce GTX 1060 GTX GAMING, 3GB GDDR5, DX12 - VR. Discover next-generation VR performance, the lowest latency, and plug-and-play compatibility with leading headsets-driven by NVIDIA VRWorks™ technologies. HDD1: Seagate 2TB FireCuda Gaming SSHD (Solid State Hybrid Drive)(5 Year Manufacturer Warranty). This workstation can handle many tasks you want to throw at it. Epic gaming audio with noise-isolation design. THIS IS A BEAST OF A COMPUTER -SUPER FAST i5 QUAD CORE, 16 GB DDR4 RAM -CHECK IT OUT ! DDR4 & DDR3L Support. DDR4 16 GB DDR4 RAM. RGB Lighting Effect with Pre-installed RGB Fans & LED Light Strip.